UNCG has a reputation of supporting and celebrating its veteran students, and this Friday will be no exception. Flags will be set up outside the Elliott University Center (EUC) to create a Field of Honor, and UNCG will host a variety of Veterans Day activities on campus this Friday, Nov. 11, throughout the day. Military recruiters will be stationed along College Avenue with a Humvee and other vehicles beginning at 10 a.m., and the UNCG Student Veterans Association (SVA) will host an MRE (field rations) sampling. The Marine Corps will offer a combat fitness test, and TeamQuest will host experiential leadership activities. 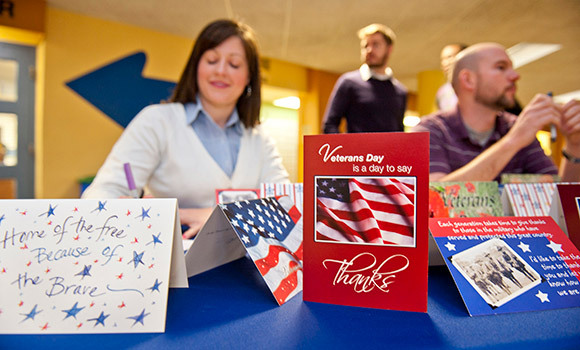 There will also be a card-signing table for veterans, sponsored by Staff Senate and the SVA in the EUC Commons, as well as a display table for the Women Veterans Historical Project. There will be a special program at 1:30 p.m. on the lawn between College Avenue and the Minerva statue. It will include a moment of silence, speakers such as Major Michael Linnane, the national anthem performed by UNCG’s Spartones and a reading of an essay by David Zochol about his experience as a student veteran at UNCG. The program will be followed by a reception at the UNCG Veterans Resource Center for special guests, student veterans and their families. Friday evening, the Spartans will kick off the men’s basketball season against the University of Virginia filled with patriotic-themed programming. The 82nd Airborne Division All American Band from Fort Bragg will perform, and Paul Chelimo, a UNCG alumnus, silver medal winner in this year’s Olympics and active military member, will be in attendance. The game will be held at the Greensboro Coliseum at 7 p.m. and free tickets are available for all military ID-holding veterans, as well as the families of UNCG’s student veterans. For more information on tickets, call (336) 334-3250 or visit the UNCG Ticket Office in the Coleman Building. Search #uncgvets on Twitter and Instagram to follow UNCG’s Veterans Day coverage. You may use that hashtag to post your own photos from campus events or to share appreciation for U.S. veterans.